Deluo, the same company that recently brought us the Bluetooth GPS for smartphones, also has available the Deluo GPSMouse. 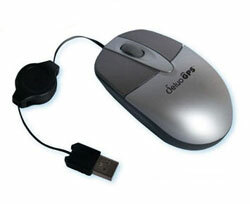 As the name implies the GPSMouse combines a GPS receiver and a travel mouse into one product. 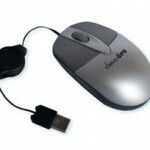 This 2 in1 gadget first works as a normal, USB-powered optical travel mouse with a lightweight design for taking with you on the go. 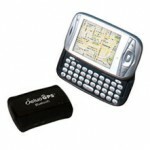 It even has a retractable USB cord built-in to help keep it compact. 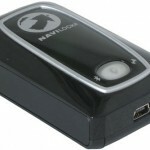 In addition, through a flick of a switch on the bottom it instantly transforms into a GPS receiver connected to your computer through the same USB cable and offering positional assistance without having to have a separate device. The MouseGPS can also optionally come packaged with Microsoft Streets & Trips giving you both pointer and street navigation in one device. What we’d really love to see is the next version of this MouseGPS to be wireless Bluetooth as well. The Deluo GPSMouse is retailing for about $100 alone or around $130 with Microsoft Streets and Trips and is now available for order through Amazon. According to Deluo CEO Facundo Formica, the official release is planned for sometime next week.